If you remember, I originally had my planner set-up to also hold my coaching notes. While the system was working out okay, for a lot of reasons, I wasn’t really diggin’ it. So I took some time to rework it. The first thing I needed was more space, since I can be working with up to eight coachees at a time. I also have learned that I prefer to use both my computer and paper when taking notes in an observation, as it allows for more flexibility. So my system needed a good amount of note taking paper, but I didn’t want coaching notes for different teachers all muddled together for me to later sort through. I also don’t totally like having separate notebooks or legal pads for different teachers. After assessing these needs and a few more, my decision was to use an Arc Notebook set-up for coaching notes only. I still have my planner, but it now lives in it’s own notebook. To avoid the muddling through notes problem, I created a different tab for each teacher. I inserted a coaching log behind each teacher tab, which I put on the left side of the notebook. I prefer this set-up, as it allows me to easily access notes from a debrief to add to the coaching log without doing too much page flipping. Also, when I go into a debrief, next steps from our last conversation are up front and center for me to see. I print out my typed up notes before going into a debrief and then handwrite additional notes from there. I used to type notes during a debrief, but wondered if it would help my coaching conversations feel more personal if I did away with the computer screen barrier. So far I think I made a good decision. Oh, and I put together this planning tool to help me think through my coaching conversations. It’s essentially a lesson plan for coaches. I keep a copy of this handy in the reference section of my notebook. This Coaching Sentence Stems reference sheet (by Elena Aguilar) has been another good addition to this section. 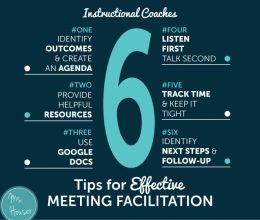 You can use it when planning for or even during coaching conversations. Check off those pieces and you’re good to go! Great ideas! 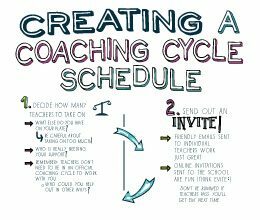 I plan to use the coaching conversation planner and may try doing an electronic notebook like you used in this post. 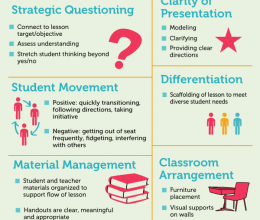 I am an instructional technology coach in Richmond, VA and I find your tips very useful! Thanks so much for commenting Michele! I love your organization. 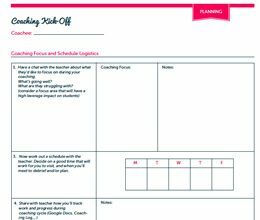 What size notebook did you use for this coaching notebook? Thanks Kristin! I use the standard letter size discbound. The junior sized ones are just a bit too small for me.